Reports of Jaroslav Halak’s demise have been greatly exaggerated. The Islanders goaltender, who has not played an NHL game since suffering a groin injury on March 8 against the Pittsburgh Penguins, has looked sharp for Team Europe in the World Cup of Hockey. The Slovakian-born netminder has led the potpourri of Europeans into the Semifinals and has given the Islanders something to think about. In the first two games of the preliminary round, Halak, who had surgery to repair a sports hernia this summer, is 2-0, with a 0.98 goals against average and .969 save percentage. He opened up the tournament by shutting out Team USA 3-0. More importantly, he kept his Team Europe and Islanders teammate Thomas Greiss on the bench. When the duo returns to Islanders training camp, it would appear that Halak is now ahead of Greiss, who led the Islanders to their first playoff series win since 1993 last season. That’s not a bad thing. Halak, who was brought in two years ago on a four-year, $18 million contract, gave New York a legitimate number-one goaltender. When healthy, he still is one. Halak, who was named an All-Star in his first season with the Islanders had a team-record 38 wins in 2014-15. The keyword with Halak is “healthy”. The Islanders for the first time in the salary-cap era are right at the ceiling. New owners Jon Ledecky and Scott Malkin lived up to their promise of spending. General manager Garth Snow could look to move Halak, who has certainly increased his trade value with his World Cup play. Snow could unload his $4.5 million cap-hit to free up space if he feels Greiss can consistently handle the workload. Greiss, a career backup before filling in for Halak last season, started a career-high 38 games, going 23-11-4, with a 2.36 GAA and a .925 save pct. The German netminder proved he can be number one. 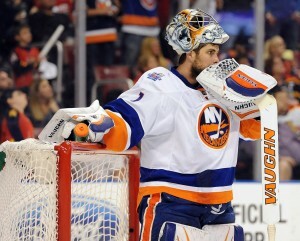 Snow cannot dump Halak’s contract for a mid-to-low round draft pick. He needs to acquire an established player if he chooses to go the trade route. While goaltender Jean-Francois Berube is no Jedi, Islanders brass is very high on him. So high that they signed him to a one-way contract this summer. Berube, who was claimed a week before the start of last season, started six games for the Islanders last season. Halak expressed his dislike for the three goalie system and it is unlikely that they will carry three to start the season. The team can attempt to pass Berube through waivers and send him to Bridgeport of the AHL. If he’s claimed by another team, Christopher Gibson is ready to fill that role of third goaltender. 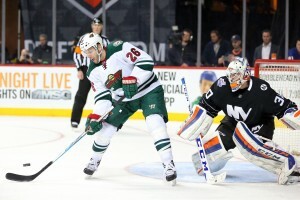 Gibson started the playoff berth-clinching game against the Washington Capitals last April. The Islanders’ goaltender of the future is currently tearing up the KHL. Ilya Sorokin is 5-0 with a 1.08 GAA and .944 save pct. for CSKA Moscow. The Islanders expect Sorokin to join the team once his KHL contract is up, two years from now. The same time Halak’s deal is up. What a coincidence. Making the playoffs is no longer a goal for the Islanders, nor is making it to the second round. To achieve their goal of reaching he Conference Finals or even the Stanley Cup, this team is better with both Jaroslav Halak and Thomas Greiss between the pipes.